Ramen Tatsu-Ya South 1234 S. Lamar Blvd. Opening its doors in 2012, Ramen Tatsu-ya is considered one of the best ramen joints in the nation. Their menu features variations of the traditional soup, including the Tonkosuto-style ramen with a sumptuous base that can take up to 60 hours to create. It is presented with thin noodles and delicious toppings including a marinated egg, savory pork fat, bamboo shoots, and roasted seaweed. Other varieties include a soy-based vegetarian version, Mi-So-Not and Mi-So-Hot, and Dipping Noodles, which feature a rich pork bone dipping sauce. Now with a second location on South Lamar, you can find your favorite ramen in both North and South Austin. Daruma Ramen 612-B E. Sixth St. Nestled right on 6th Street, cozy Daruma Ramen is the ramen expansion pack of Kome Sushi. Instead of the heavy pork broths favored by most, Daruma specializes in light, whole chicken broth. The refreshing broth is paired with eggless, tapioca-based noodles and topped with colorful ingredients including bok choy, bamboo, fish cakes, sesame, and delicious chicken chashu. Customers can also choose from a spicy Miso Ramen, a Veggie ramen with tofu, and another version overflowing with fresh seasonal veggies including tomatoes, avocado and carrots. Open up and say yum. Michi Ramen 6519 N. Lamar Blvd. Michi Ramen serves up traditional ramen with a Texas flair. The intricate menu allows customers to build their own ramen bowls by choosing a noodle type, broth, and a wide array of toppings ranging from traditional (bamboo, roasted nori) to eccentric (spicy BBQ sauce, jalapenos, toasted lemongrass). Ramen options include tonkotsu of both shoyu and miso variety, a shiitake veggie option, dipping noodles, and two specialty ramens. 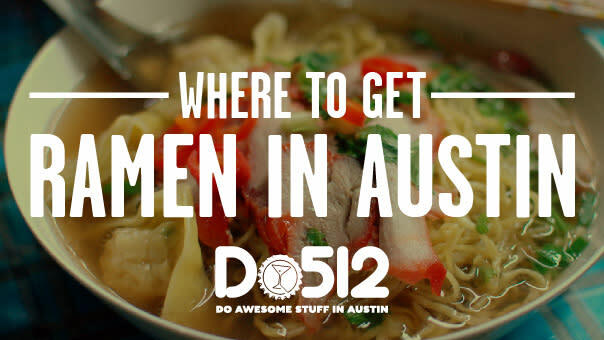 They even have a Texas-style ramen, featuring tomato tonkotsu paired with smoked BBQ ribs, spicy sauce, jalapenos, and vinegar slaw with Texas toast. You can now find Michi take-out on South Lamar as well, for more ramen all the time. If you&apos;re crazy about noodles, dig a little deeper and you can find ramen dishes at a number of local restaurants that are lesser-known for their ramen. Popular Japanese restaurants Musashino (3407 Greystone Dr.) and Soto (11066 Pecan Park Blvd.) are both destination spots for sushi, but you might not know that both offer ramen as well. Take note of the Texas Ramen at Musashino, a spicy soy-based ramen with tempura fried okra, bean sprouts, chinese broccoli, and the kicker: BBQ brisket. Other, lesser-known restaurants you should include on your ramen roundup are Xian Sushi and Noodle, Odaku, Shabu Ryu of Japan, and Yanagi. Shabu offers a BBQ Pork option, a Tiger Shrimp and Shiitake option, and "Street Ramen" with Spam, beef, eggs, and baby bok choy. Page has been one of the core Staff Writers for Do512 since 2013. She is a freelance journalist for several publications, and previously worked as a media producer for Tequila Mockingbird and production coordinator for Chez Boom Audio in Austin.